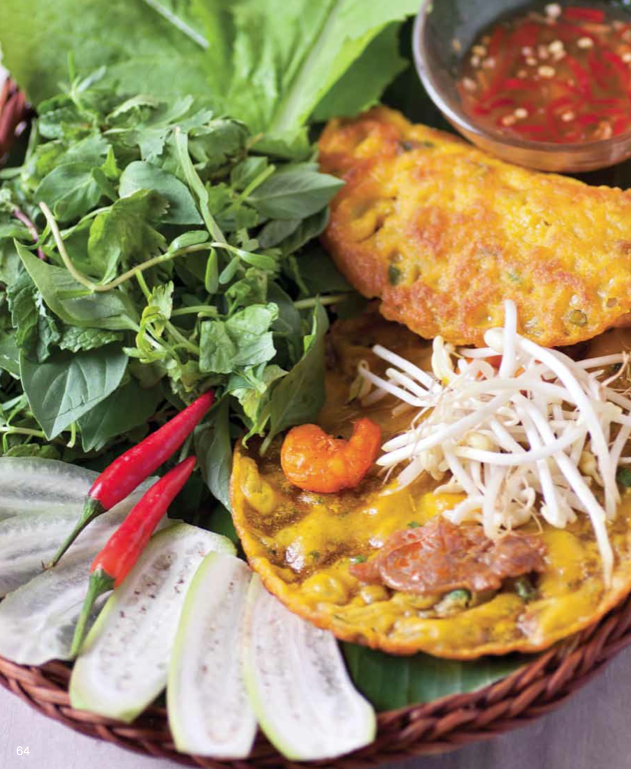 This savoury pancake dish is wrapped in rice paper and eaten as a finger food. Originally from the South, this dish is eaten mostly during wintertime. It is a good example of the harmonious balance of taste and textures in Vietnamese food: fresh and fried, sweet and sour, soft and crunchy. * bánh xèo powder can be purchased from any good Asian grocer. This can be used in place of making the batter. Soak rice in 2 cups water overnight. Also soak mung beans in 2 cups water overnight. Add 1 cup of water to rice and blend until a smooth liquid forms. Rinse mung beans well and drain. Add ½ cup water and blend until a smooth liquid forms. Mix the 2 batters together and add turmeric, spring onions and coconut cream. Stir well to combine. In a bánh xèo pan or the smallest frying pan you can find, heat 1 tsp oil. Put 2 slices of pork in hot pan on one side and cook 10 seconds on each side. Place 2 shrimps in pan on other side. Ladle in a small amount of mix and tilt pan to distribute evenly. Fry for 3-4 minutes until lightly coloured and crispy. Place a handful of bean sprouts on the side closest to you, then fold the far side over towards you, creating a half-moon shape. Continue cooking 1-2 minutes on each side. Repeat with the remaining batter to make 8 pancakes. Keep warm. On a sheet of softened rice paper put a bánh xèo, a handful of herbs, a star fruit and green banana slice and roll up.